JONAH was commanded to go to Nineveh, and cry out that the city should be destroyed on account of the wickedness of its inhabitants. But instead of obeying God's command he fled in a ship that was bound for Tarshish. Then a great storm arose, and the shipmen cast Jonah into the sea, believing that the storm had been sent through his disobedience. God saved Jonah by means of a large fish, and brought him safely to land again. A second time God said to Jonah, Arise, go unto Nineveh, that great city, and preach unto it the preaching that I bid thee." So Jonah arose and went to Nineveh just as God had directed him. Now Nineveh was a very large city, about sixty miles in circumference, and Jonah went some distance inside and then cried out, "Yet forty days and Nineveh shall be overthrown!" 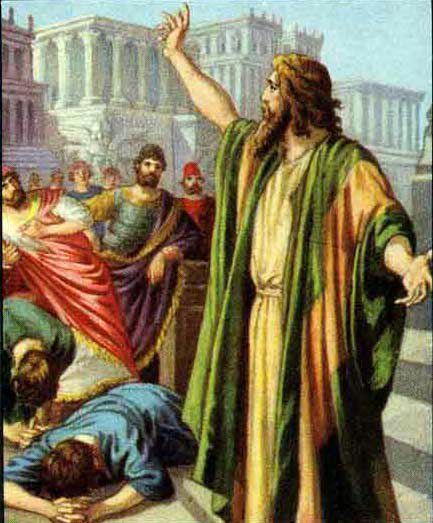 It was a strange and terrible cry which sounded throughout the city, and as the Ninevites heard it they feared God, proclaimed a fast, covered themselves with sackcloth, and every man was commanded to forsake evil. So they hoped God would forgive them and spare their city. God saw what they did and how they repented and turned from their evil ways, therefore He spared their city. When Jonah saw that Nineveh was spared he was very angry, and prayed God to take away his life. He made a booth and sat under it to see what would become of the city. Then God sheltered him from the sun by a gourd, and afterwards taught him by it how wrong he was in being displeased because Nineveh had been spared. Nineveh was finally overthrown long afterwards, and has remained since then but a heap of ruins.